Entire books have been written on this subject, and the early church did a lot of things today's church should copy. But one thing the early church did supercharged the spread of the Gospel. What was it? It had to do with the method of preaching. The first century church preached God's Word in a way you rarely hear today. And the Bible says God's Word will never come back empty (Isaiah 55:11). It always produces. What did the early church do so differently? They preached this special message - "The Messiah you're looking for is Jesus" (Acts 5:42). At first glance, this doesn't seem unique. After all, many people today preach "Jesus is the Messiah." But that's not all the early church preached. The Gospel they preached included a critical element we often overlook today. Go back and read Acts 5:42 one more time. To the early church, Jesus was more than just the Messiah. He was the Messiah "you're looking for." In the first century, everyone in Israel was looking for the Messiah. The Jewish leaders asked John the Baptist is he was the Messiah (John 1:19-21). The wise men traveled from distant lands to find the Messiah (Matthew 2:2), and King Herod tried to kill the Messiah (Matthew 2:16). This begs the question - why was everyone "looking" for the Messiah? One simple reason. Messianic fever ran rampant in that generation because the scriptures said the Messiah would come. The Jewish scriptures pointed to the coming of a Messiah, a Savior for both the Jewish people and the entire world. A number of passages known as the Messianic prophecies detailed the Messiah's birth, life, death, and victory over the grave. They told how His sacrifice would save a multitude from "death in a waterless dungeon" (Zechariah 9:11). And those prophecies said the Messiah would appear at that exact moment in history. So it's no wonder people were looking for the Messiah. For the early church, preaching the Gospel meant more than simply proclaiming "Jesus is your Savior." It meant teaching "Jesus is the Messiah, the one the scriptures point to." Jesus said Himself, "The scriptures point to me" (John 5:39). In other words, the early church taught fulfilled bible prophecy. They pointed to Jesus and His fulfillment of the Messianic prophecies as proof Jesus is the Messiah. For unbelievers, this is a powerful message. It provides rock solid evidence of the identity of Jesus. Fulfilled prophecy proves Jesus is who He said He was - the Messiah. 1) Peter - Peter pointed to the fulfilled Messianic prophecies as clear proof Jesus was the long awaited Messiah (Acts 2:14-40). His speech on Pentecost led three thousand people to give their lives to Jesus (Acts 2:41). Preaching in the Temple, he said the life of Jesus fulfilled what the prophets had written about the Messiah (Acts 3:18-24). Many of the people who heard Peter's message believed it (Acts 4:4). Later, when sharing the Gospel with Cornelius and his household, Peter said Jesus is the One "all the prophets testified about" (Acts 10:43). Again and again, Peter pointed to fulfilled prophecy as the foundation for belief in Jesus. In Caesarea, Paul said, "I teach nothing except what the prophets and Moses said would happen" (Acts 26:22). Paul asked King Agrippa, "Do you believe the prophets?" (Acts 26:27). In Rome, Paul preached, "the hope of Israel - the Messiah - has already come" (Acts 28:20). Paul used "the law of Moses and the books of the prophets" to persuade the Romans about Jesus (Acts 28:23). The Bible shows this was a common technique in the early church. It says Apollos also used the scriptures to explain that Jesus was the Messiah (Acts 18:28). The truth is clear. If you don't study bible prophecy, you're missing one of the greatest evangelistic tools of all time. What better way to respond to those who demand evidence? What better way to demonstrate Jesus is the Messiah than to tell people about the many prophecies He fulfilled? Most of all, ask them, "Did you know one person fulfilled all these prophecies and more?" His name is Jesus. That's right. Jesus and Jesus alone fulfilled these prophecies. He's the fulfillment of everything the prophets wrote (Matthew 5:17). Hundreds of years before the Romans invented crucifixion, the Bible described the Messiah as suffering from just such a punishment. The scriptures said His hands and feet would be pierced (Psalm 22:16). They were. The scriptures said they would give Him bitter wine to drink (Psalm 69:21) and pierce His side (Zechariah 12:10). They did. The scriptures said they would gamble for His clothes (Psalm 22:18). They did. 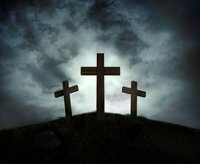 Most of all, the scriptures said He would conquer the grave (Psalm 49:15). He did. They said, because of Him, you are counted as righteous in the eyes of God (Romans 4:24). And guess what? You are. May the whole world praise the name of Jesus!